Posted on November 19, 2014 by staceyanderton1	in Uncategorized and tagged Bulldogs, Hockey, MHS. Saegertown players Chase Leech, middle, and Luke Triola, right, face off in a recent match. Saegertown Sophomores, Luke Triola (25) and Chase Leech (36), are spending their winter lacing up the skates, tapping the sticks, and shredding the ice all day as they join the Meadville Bulldogs Varsity Hockey team. Currently, the focus of winter sports at Saegertown is on wrestling and basketball. Although hockey is not offered here, Triola and Leech have been able to join a newly found team and make it popular with students outside the walls of Saegertown. The boys started their season in October and currently sit at 4-4-1 overall. Triola has three goals and five assists; Leech has one goal and four assists. 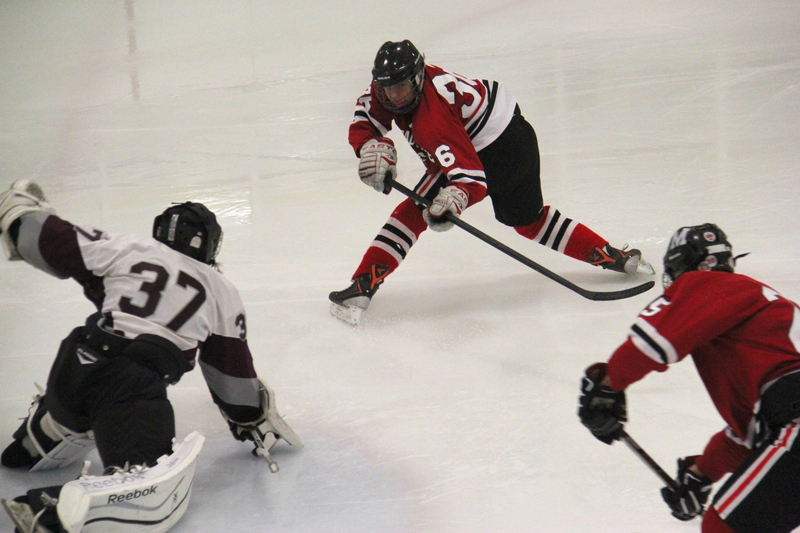 They played Peters Township last Tuesday, and the Bulldogs came out on top with a 3-2 victory. On November 18, Triola scored a hat-trick and led the Bulldogs to a 10-3 victory. The Bulldogs will be back in action Thursday, November 20, at Harbor Creek.